This Christmas, I’m asking for the gift of hope. I don’t mean the kind of hope we casually toss about in our every day conversations. We say “I hope you feel better” and what we really mean is that we want it to be true, and — fingers crossed — maybe it will be. It is no more than a wish we might make on a shooting star. That kind of hope is easy, cheap and useless. No, the hope I want is different. Not a facile, throwaway pleasantry, the hope I want is grounded in certainty and expectation. When God’s people say they have hope, it means they fully expect something to happen, despite any evidence to the contrary. In the times of trouble, when darkness whispers that there is no light and never will be again, people of hope hear another voice. Probably the most radical thing the Christian faith teaches is that even in these dark moments — especially in these dark moments — we can can hear that other voice, reminding us that God is faithful. Faint at first, then growing stronger and louder, we hear the words that say we can hope in God because He has never forsaken us and never will. Although we can’t be certain how or why or when, hope says we can be confident that God will act. Now this is a young woman who has every reason to be afraid and worried. She knows that her pregnancy will, at best, make her the subject of gossip, snickering and shaming. She knows that at worst, it could lead to her death as an adulterer. She has been given the unimaginable responsibility of raising the Messiah, something nothing can really prepare you for. Confession: There’s a cynical world-weariness still lurking in dark corners of my soul that thinks this not something a real person could actually do or feel in times of trouble. The Mary I met in Sunday school was someone so impossibly holy that although I found her admirable, she was no more real than a princess in a fairy tale. And yet, as I have grown in age and faith, I know that there are people — real people — who have the same kind of expecting hope as Mary. Real people who face uncertainty with the certainty that God will act. Ordinary people who face death — their own or others’ — with a peace that undergirds to their grief. And I ask myself, how do they do it? How did Mary? The power of the Holy Spirit is what will make the impossible — a virgin conceiving — happen. It is also what makes it possible for her to have the joyous hope she sings about in her great song of praise. Her expecting hope is nothing less than a gift of the Holy Spirit. My jaded reaction that having this kind of hope isn’t something that real people could do is partly right: it isn’t something that comes naturally to us, or something we can manufacture. It is a gift we receive from God, a gift we can ask for and that will be joyfully given, a gift we can nurture, a gift that is nothing less than a beautiful mystery. This entry was posted in Advent, Christian Life, Christmas, hope, prayer, Trusting God, Uncategorized and tagged Advent, Christian hope, Hope, Magnificat, Mary, trusting God by Laura LaSpalluto. Bookmark the permalink. 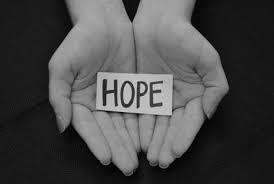 Great word of hope Laura – as an “ordinary ..real person…” I am asking for more hope and expectency ! Thanks for reminding us of the meaning of Advent! Enjoyed the reading. I too want “the Holy Spirit to overshadow me” and to “Abound in Hope”-praying that for 2017.